All rootbeer is not created equal. Not by a long shot, and that's what our family has set out to prove every year since 2012, one shot at a time. Last week we had our 7th annual rootbeer tasting night and it will go down in the annals of our history, if not our bowels, as one of the worst tastings we've had! We had one clear winner and it wasn't even really a rootbeer, more of a cream soda! So as a way of public service, I'm going to share the rootbeers we have tried over the last 4 years, (I failed to keep records before then!) The stars mean we liked them, and the x's mean we would never let it touch our lips again...unfortunately we were not really great at taking notes on each rootbeer...too much laughter, spitting out and burping for that (not moi, mind you, but the men-folk have no trouble burping their thoughts after each sip!) There are hundreds of different flavors of rootbeer - we usually sample about 8 to 10 at a time, so at that rate, it will take us 30 years to taste them all! Even though we try not to repeat brands, we do. We get in the store and completely forget to look at our list of our previous purchases! We are easily influenced by the name and the label! We do ask the rootbeer "experts" what they recommend but usually they are rootbeers that are super spicy or hot...not our cup of tea beer! This is my dear ol' Dad from 2012 - taken at the Rootbeer Store that used to be in Redmond. Dad loves rootbeer - even used to make his own back in the day! So you see, the rootbeer gene was passed down to me from dad...that and my ability to wield a hammer! I didn't get his Engineer brain, however, but I'm happy to have his love of rootbeer - seems like a good trade off to me! Here's the skinny on what we do...Weather permitting we have our tasting out on our deck so we can toss the rootbeer we don't like down on our unsuspecting plants below. If the weather doesn't allow, we put a big bowl in the center of the table and we dump the horrid-scrap-it-off-our-tongue-make-it-stop-rootbeer that's left in our glasses into the bowl. We use little glasses, think shot-glass size. We pour about a tablespoon of rootbeer into each glass and we sip and swirl, ala wine sommelier, and then give our opinions...everything from "Ewwww gross, it tastes like a candle!" to "Yummmm, pour me another shot!" At the end of our fun we are left with half-full bottles of rootbeer. We usually offer them to the neighbor's kids...they don't save and since we don't drink from the bottles no one will get our cooties! Rootbeer is filling...the bloat is real...so if you do this, pace yourselves! And remember to serve it chilled!! If you don't have a rootbeer store near you (the closest one to us now is in Lynnwood) you can always order it online! Did you know there is a National Trial Mix Day? It's right around the corner - August 31st! Actually we are in the midst of Trail Mix season...summer is filled with people hiking, camping and lounging about at the beach and they usually pack some kind of Trail Mix to take along...nuts, oats, dried fruit, that sort of thing...unless you're me and then you pack chocolate, candy, dried fruit and one oat...to each his own! I do love Trail Mix and we always have some in the pantry - not only is it a great late-night snack for me, it bakes up great in cookies! Today though, I want to show you how to make a boring chicken dinner into a Trail Mix chicken dinner winner! I pulled out every different kind of nut I had in my pantry...pecans, hazelnuts, madacamia, pistachios, and almonds. All great in Trail Mix. Then I found some pepitas, dried pumpkin seeds - I love them on salads and as soup toppers but they are great in Trail Mix, too. I also pulled out some dried fruit and instead of reaching for raisins or Craisins, I opted for dried dates and Goji berries...every had them? They're a bit like dried cranberries, same color, same chewiness, just a little more sweet and they're supposed to be a superfood from the Himalayas! Move over Yeti! My Trail Mix always has oats in them, don't ask me why, it just does. I guess I like the way the oats stick to the dried fruit so I can eat oats and not really know about it. Deception is key in my Trail Mix. What isn't in this Trail Mix is chocolate or gummy bears or candy...all wonderful additions to Trail Mix but I just didn't think those things would work with chicken, call me crazy! You can put all of the nuts and fruit into a food processor to chop into little bits but I decided to use a knife so I would have a rougher chop - some larger pieces, some small. This is really such an easy recipe and it comes together quick...set up your assembly line...chicken tenders, eggs, Trail Mix, then you're ready to dip! They look so great, no? The crunchiness from the nuts, which get roasted in the oven, provide so much flavor to the chicken...but wait, there's more! The dried dates and the Goji berries provide a sweetness that just hits the spot...and if you're still not sold, these little beauties have their own dipping sauce - a honey mustard with a touch of horseradish - man-o-man-alive, these are dang good my friends! They'll be a hit over the camp-fire, straight from the grill, or pulled from the oven - Trail Mix Chicken, circle the wagons and get out your nuts...this one is dang good! Preheat oven to 375 degrees. Line a rimmed baking sheet with parchment paper, then spray with baking spray to prevent sticking. Finely chop all nuts and dried fruit to desired size. Add nuts and fruit to a medium bowl, stir in oats and flour. Break eggs into a shallow dish and mix well with a fork. Stir in salt, and pepper. Dip chicken tenders into egg mixture, coating well, then dip into Trail Mix, pressing mixture onto chicken. Place chicken onto prepared baking sheet. Repeat until all chicken is coated. Press any remaining Trail mix on top of chicken. Bake in preheated 375 degree oven for 20 minutes total, turning each piece over after 10 minutes. Remove from oven and serve with Honey-Horse Dipping Sauce, recipe below. If you're sitting around a camp-fire, feel free to eat these with your fingers, just dip them into the sauce and let it drip down your hand, then you can bite and chew and lick till your heart's content! Mix all ingredients together in a small bowl, serve with Trail Mix Crusted Chicken...YUM! Full disclosure: Nuts.com asked me to participate in a Trail Mix contest...so this is my entry...and no matter what they think, this is definitely a winning recipe!! The mister did it again. He was in charge of purchasing airline tickets for an upcoming trip...he said he would take care of it - leave it to him - he's got this. Should have known better. Mister and Missus Indecisive (the mister and moi) changed their minds/plans after he had purchased the tickets, a little fact that the mister declined to inform the missus of...it wasn't until the mister was sent into a spasm of uncontrolled kanniptions when he was told by Delta, "Sorry sir, but we do NOT refund money, you have one year to use the tickets and if you want to change them, you'll have to pay a fee..." that the missus was given ALL of the facts. But it doesn't end there...nope, again without consultation, the mister paid Delta $500 and rebooked the tickets...I'm pretty sure we would have had a lot more fun just flushing 500 one dollar bills down the shi$$er than GIVING them to DELTA for yet another one of HIS mistakes! I'll bet you're wondering where the mister is taking me? Not to Washington, DC like we had planned, or to New York, like we had discussed, or to Banff, which is on my bucket list and the mister knows I really want to go...no, none of those places. So I should be given some kind of badge for containing my excitement when the mister informed me, all jovial and giddy that he had rebooked our tickets to Knoxville so we could go see a University of Tennessee Basketball game. Oh, he had already bought the game tickets. And he's so happy. Happy, happy, happy. Me? Not so much. The mister is going to be the death of me. Nothing wrong with Tennessee, or Knoxville, nothing at all...but when you've had your heart set on one place and you get another...well, you get my drift. Now that THAT is off my chest, let's cut to the meat of this post - literally. Let's talk turkey. As in Fried Turkey for T-Day. We've talked a lot about turkey - I've chatted with many of you over the years about turkey...we all love turkey and a lot of us love fried turkey but we just don't want to risk an explosion or time in a burn unit or the house going up in flames! Watch the video clip above...who needs that?!? I was THRILLED to find out from my BFF Chris at Nibble Me This (who just so happens to live in Knoxville!) about this NEW oil-less turkey fryer!!! Chris is going to give one away on his blog - and I just had to tell you about it - I know you will want one as much as me, and what better way to get one than to win it?! Look, this is a dream come true for me!! I'm getting nothing, nada, zilch from this telling you about this NEW fryer from Char-Broil - it's called The Big Easy. Go visit Chris, read all about The Big Easy oil-less turkey fryer and enter his contest...if you win, you can thank me by frying me up a turkey and Fed-Exing it to me by T-Day. That's all. I require so little. Pic on left courtesy of Nibble Me This, hope you don't mind me lifting it Chris! By the way, when we come to Knoxville I will give you plenty of notice so you can fry me up a turkey! The contest ends November 11th so get a move on. This is a clean-up post...lots of odds and ends that had no place to go so they ended up here...sit back and relax...it's going to be a bumpy ride! The The Rootbeer Store in Redmond, WA has over 100 different kinds of rootbeer - we brought home about a dozen to try...some we liked, some we didn't...for example, I loved the Jamaican Gingerbeer but my dad, pictured above, thought it tasted like medicine and he didn't appreciate the slow-burn afterwards! He liked the one called "Duh" and I thought that tasted like swill! We enjoyed tasting them all...while we nibbled on Radish Sandwiches...I'm still on the radish kick! Anyway, if you live near Redmond you really should pop in, it's a great place and along with rootbeer they have a great assortment of cream sodas! I think there is a Lynnwood location, too. We need to talk about the radish sandwich for just a minute...after I posted about French Radishes, I heard from several readers who said they either grew up eating radish sandwiches or they eat them now! What a thought! I told my parents about this and they said it was very common place "back in the day" - especially for poor people! Well, I'm going to go on record and say, even if I'm living under a bridge, I shall not enjoy or be more thankful for a radish sandwich than I do/am today! They have become my new happy hour staple...and I can't believe I had never had one before last week! I make them with pita bread, slathered in butter with a bit of mayo...sliced radishes seasoned with salt, pepper and fresh parsley. Simple and so good. Truly. Rich or poor...this one's a keeper! One day, when my brain was barely operating, I agreed to be the camp cook for one day...one day for 230 girls...one day that has involved many days of shopping and cooking ahead of time!! I had NO IDEA what was involved in cooking for 230 people! It's mind-boggling! 11 (six lbs. each) bags of chicken tenders from Costco - that's 66 lbs. of chicken! which is now marinating in a lovely teriyaki sauce,in the "coffin-cooler"
50 lbs. of rice...I cooked 25 lbs. myself and then, reeling from starch fumes, I called in some reinforcements to help! Thank you dear friends!!! All of this is just for ONE night...I'm told a huge trailer was used to transport the food for the entire week up to camp! And here's the amazing thing...the girls pay just $90 each for four days at camp and that includes 3 meals a day and snacks plus everything they make and do while there!! Today is the big day/night...I'll be going to girls camp to cook/serve/slave...then I'll be looking for some serious blessings to come my way starting tomorrow! Oh...I made the camp flag, too...their theme this year is "Survivor" - which I hope to be when all is said and done. Ciao! Mi chiamo Nan. Io sono de Utah, ma abito a Seattle. Mi piace faray il dolci i cucinare. Oggi e' il diciotto Luglio 2012. Il mio compleano e' il Decembre. That's what I've learned so far in my Italian language class! Si! I'm taking Italian!!! It's very fun but not one bit easy! I've discovered I have a 5-minute attention span...and I don't know how to study and I have no memory! But I'm really liking my class and with any luck at all I'll be able to learn enough Italian to purchase fresh veggies and fish at a Tuscan market...next summer...when we go to Italy for FOUR weeks to LIVE! Well, that's the plan...I haven't told the mister yet...waiting for just the right moment...like when we win the lottery...what? It could happen! Okay, that's it - time to rotate the chicken, fluff the rice, cool the melons, turn the beans and hit the dusty trail...I've got to get my camp on! Can you stand one more plea from me? I need you to vote for me. Please click HERE. Click on VOTE. Click on Nan Slaughter. I will be ever so grateful. I need my number to rise. I will thank you by posting the recipe for the best German Chocolate Cake you'll ever taste on Monday morning. You'll want to make sure there's ink in your printer. No kidding. It's dang good. Now please go vote for me. Time to Vote for Me Again! Click here...then click on Vote...then find my name (Nan!) and click on it...don't you dare vote for anyone else! I would be so, so sad! You know, if I win I'll get a crown!! That's right...me in a real crown instead of the imaginary one I put on each day...at least I think there's a crown...I will be devastated if there isn't one!! I'm sure it's just like the one the Queen wears...pretty sure...but you won't have to bow or call me Your Highness...just a simple curtsy will be fine ...and you won't have to call me Mrs. Holiday, unless you're speaking directly to me! Hahahahaha...this would be SO fun...well, for me! Okay, go and vote...please...I need more votes...like a burger needs a bun...like a sundae needs a cherry on top, like breakfast needs bacon! And you can vote every day! Christmas Wreath Quilt...And A Giveaway! My mom loves her little quilt and keeps it out year round, folded over the back of her bench by her door. When I go and visit my parents I see the little quilt and it always makes me smile and then I always tell myself that the minute I get home I'm going to sew one for me! Which I never did - until now! Mom's little quilt, which measures 40-inches x 40-inches is one of the quilts featured in the December banner over at Sew We Quilt! Such a fun honor for this little quilt! When Samm asked for pictures of Christmas quilts to be submitted for the December banner, I sent her several pictures - I seem to have a lot of Christmas quilts - most of them without mistakes! And when she emailed to say my little quilt had been chosen for the banner I was thrilled!! I would have told Samm about the mistake, which surely would have eliminated my quilt, but I had not yet noticed it! About 6 months ago I decided this would be the year to make myself one of these little beauties...but I couldn't remember the name of the pattern. I searched through my patterns and even looked on-line for "Christmas Wreath Quilt" but found nothing...so I did the next best thing...I drew it! Now do you see it?? I didn't notice the mistake - the HUGE GLARING MISTAKE until I had completely finished quilting it...and not only did I sew the squares together wrong (on the right side of the wreath!) but I sewed them wrong on my mom's quilt 11 years ago!!! And never noticed until now!!! So while this was going to be a gift it will now be part of my ever growing personal collection of mistake quilts because I certainly can't give this to anyone now! And after all these years I've finally figured out why my mom keeps the same half of the quilt folded over her bench!!! Here's the 2nd quilt in as many days...this one was sewn right - whew! Which only goes to show you this IS a fast and easy quilt to put together...when it's done right! And now that I have the right pattern imprinted in my brain, I just might sew up a few more! #101...Patty, who said: "What a fancy schmancy apron, it's simply Ghastlie!" And that it is Patty! Ghastlie through and through! So happy you've won...I'll send you an email and you can send me your snail mail address! Thanks everyone for playing along and for all of your nice comments! 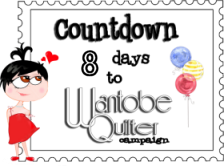 to the Wantobe Quilters Campaign!! It's going to be three months worth of FUN and PRIZES for BRAND NEW QUILTERS! you need to get you going!! Stash is going to giveaway prizes FIVE times a week for TWELVE weeks! Do the math - that's a lot of loot! and I use that term loosely! something, I can win something too!! Oh, you also need to head on over to Stash and become a follower of that blog - which if you're not already, you will love. Thatis it!! There are over 49 Sponsors involved. For more information click on over to Stash and read all about it...but remember to tell them I sent you! If you haven't discovered these beans yet - yes, they're from a can, then you're missing out. Easy, tasty and downright good. One of my favorite food blogs is hosting a nice little giveaway, sponsored by Bushes Beans...you remember Jay and Duke, right? Well, they've ponied up a nice little prize package and it could be yours just by entering...so click HERE and go visit Chris at Nibble Me This...oh, but put a bib on first because his posts are filled with drool-making pics! Don't say you weren't warned!